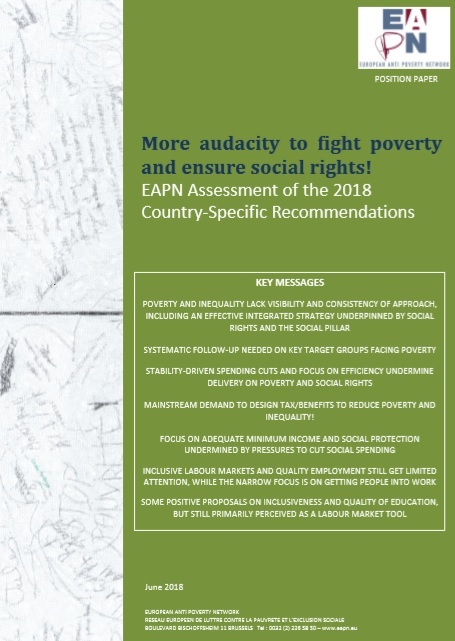 EAPN presents its members’ assessment of the 2018 Country-Specific Recommendations (CSRs): More Audacity to Fight Poverty & Ensure Social Rights! On the 23rd May 2018, the European Commission adopted the 2018 Country-Specific Recommendations and published a Communication. The European Pillar of Social Rights is clearly visible, highlighting key ‘social challenges’; the results for social rights is not so clear however. The Communication mainly develops proposals related to the 3 re-stated priorities of the Annual Growth Survey, promoting a ‘virtuous triangle’ of boosting investment, pursuing structural reforms and ‘responsible’ fiscal policy – albeit with the possibility of more flexibility around investment and less austerity to reduce public deficits/debt. However, the implementation is not always easy to see in the CSRs themselves. It is not clearly stated how the full set of Social Pillar principles or the ‘social scoreboard’ has been taken into account, nor the link with the current Europe 2020 strategy, particularly the poverty target to reduce the number of those at risk of poverty by at least 20 million by 2020. On p.8, the Commission calls for audacity to “preserve reforms in pensions and health”, which are essentially social cuts, but does not call for audacity in combating poverty, and protecting people from blighted lives, ruined hopes, constant struggle, ill-health and strained relationships. This paper sets out the main messages and recommendations from country-by-country detailed assessment of the CSRs, carried out together with our members, in terms of their contribution to the fight against poverty, exclusion and inequality. A detailed country by country analysis is annexed. Mainstream demand to design tax/benefits to reduce poverty and inequality!